American West Beef (from Boulder, Colorado) offers the finest in beef, bison, lamb, poultry, fish and pork. The site offers tools to let you select the right meat and cut. 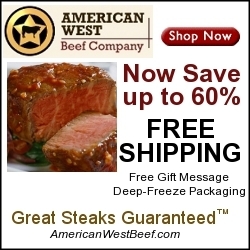 To simplify shopping, American Beef offers free shipping on all orders. If you are shopping for a gift, you might consider a gift certificate as it gives your gift recipient greater control over their dinner.